I found another way to use my renaissance costume this season. 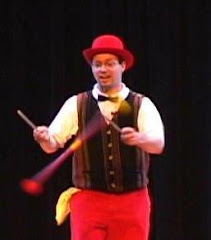 I got hired to juggle in the St. Albert the Great church epiphany pageant, called the Boar's Head pageant. I don't think I've seen an event quite like this before. It' s not a play, precisely -- there's no narrative -- it's mostly about getting groups of people into costumes and having them parade around. This is in the grand tradition of church pageants, historically. But here it's accompanied by singing and music. They had a 25 piece orchestra, which was nice to see. The pageant enacts the epiphany story, combined with a board's head feast. The costumes were amazing. There were so many people involved that it was a major feat of logistics: there were swiss guards, jesters, nobles, king and queen, the three visiting kings, angels, on and on and on. The church has been doing this show for six years. Admission is free-but-please-donate. Husband, father, writer, juggler, and expert washer of dishes.